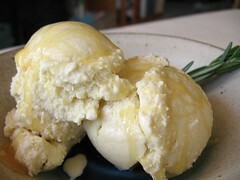 SHF #15: Rosemary Honey Ice Cream - Do You Know The Muffin Man? This is my contribution for the January 2006 Sugar High Friday hosted by Sam; the theme is Sugar Low. I knew I wouldn't make anything that used artificial sweetener, because, well, I try to use natural ingredients as much as possible. Plus, I don't believe in low-fat or low-sugar (I prefer the philosophy of everything in moderation). So, my take on this event was to make a dessert that would incorporate a natural sweetener. At a fundraiser book sale last year, I picked up a couple of back issues of Gourmet, including the August 1993 issue that featured several unusual ice creams. For example, the magazine has recipes for Fresh Corn, Guinness Stout, White Pepper, and Chocolate Chili ice creams. I suppose nowadays, these flavours may be pedestrian in some circles, but a decade ago, they were probably very avant-garde. The recipe that caught my eye is attributed to Charlie Trotter's restaurant in Chicago and paired the distinctive flavour of rosemary with honey, an interesting combination that I had to try. I started the cream infusion by dumping a litre of table cream over the rosemary and letting it come up to a simmer. Note that recipe online says 32 to 42 sprigs: I think they mean rosemary leaves, as the version in the magazine calls for six 3- to 4-inch sprigs. To avoid giving my tasters a heart attack, I scaled back from eight eggs to five then whisked the yolks together with the honey. I substituted plain sugar with maple sugar, dissolving it in the cream infusion rather than the eggs as it had dried out somewhat. After neglecting my cream (don't do this! ), during which it boiled over, I slowly tempered the egg mixture by stirring a small portion of the infusion into the yolks, then pouring it all back in the saucepan. When it reached 170°F, I took it off the heat, then strained the custard into a bowl. Before it came to room temperature, I pressed some plastic wrap on the surface so a skin wouldn't form, and chilled it in the fridge. The verdict? My first spoonful was so unexpected that I thought I had made a mistake in following the recipe. The flavour seems vegetal (carrot-like) at first, then the subtle notes of rosemary reveal themselves. More than one taster detected a ginger taste; it does have that flavour, but without the characteristic spiciness. Honey makes a perfectly fine sweetener for ice cream, so it's an ingredient I'll try to use again. If I had followed the directions and used the richer creams and the full amount of eggs, this would have been a rich and luxurious dessert. But, in keeping with the theme of sugar low, this reduced-fat version, free of any refined sugar, still turned out quite nicely.